Toowoomba Regional Council Cr Chris Tait, Senator for Queensland Pauline Hanson and Member for Condamine Pat Weir. PAULINE Hanson is eyeing off seats in the Toowoomba region and was mobbed by supporters during a visit to Oakey today. 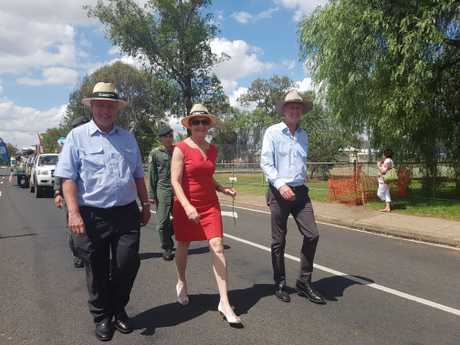 The popular political firebrand walked with LNP MP Pat Weir and Toowoomba Regional Council Cr Chris Tait at the Oakey Together parade this afternoon. Ms Hanson then met with supporters who eagerly lined up to meet her. One young supporter declared she was the "Donald Trump of Australia". The One Nation senator certainly identifies with him, writing on Facebook "Looks like Donald Trump and I are speaking the same language." She also celebrated his win with a live video writing "Congrats President Donald Trump" and "#MAGA", referring to his popular slogan "make America great again". Do you support Pauline Hanson? This poll ended on 31 December 2016. Ms Hanson said she was invited by the council to visit Oakey and also wanted to support the town, which is dealing with a groundwater contamination issue. "Considering what's happened in the past with the contamination of water - I was here prior to the election and spoke to locals. "I think my input then got them onto Alan Jones - which got them recognition in trying to get something done about it. "Being a senator for Queensland this is part of my electorate. "I live about two and a half hours down the track. "Before I got elected I said I intend to get around Queensland." She said One Nation had "a lot" of support in the area. "People know what I stand for and what I'm trying to do for Australia and Queensland." 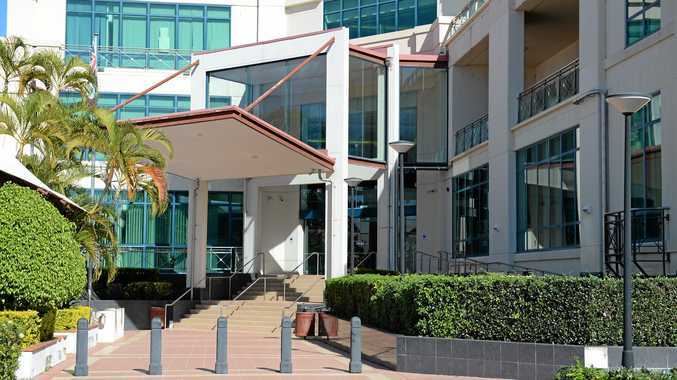 Ms Hanson said she was considering running a candidate in the electorates in and around the Toowoomba region. "We're announcing our first batch of candidates next weekend... at this stage we're running 46 candidates." One of the women waiting to meet Ms Hanson said One Nation would do well in the area, even beating the entrenched LNP. "The LNP don't come out and listen to us," Claire Lawrence said. "Pauline is here, we haven't seen any ministers - at any of the events. "She's looking out for us and says what we think." Ms Lawrence said there were some similarities between Ms Hanson and Mr Trump, in that "they both listened to the people". "But she's more tactful than Donald Trump. "He says the right things but in the wrong way. "Ms Hanson says it the way we would." The two politicians have some policies in common including on Islam. Donald Trump promised to stop Muslim immigration and Ms Hanson's policies state the party will: "Stop further Muslim immigration and the intake of Muslim refugees".